For over 10 years EB Games has been the number one place to purchase video game related products and media. Over this time we have evolved rapidly and now encompass over 370 retail locations throughout Australia. Our retail locations are what set us apart and we are committed to being considered the first choice retailer for all customers who want to purchase entertainment products. Everything that we offer from our expansive selection of new products, to our knowledgeable associates and our value-added pre-owned products are geared to deliver an experience like no other. To complement our expansive store network we have also created an online store that allows us to provide products and services to customers that have not traditionally had access to stores. 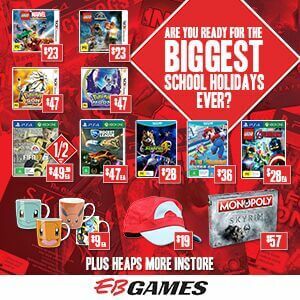 EB Games Biggest Sale Ever continues over these school holidays! Are you ready for the BIGGEST school holidays ever? Play together or adventure solo with tonnes of great games, trading cards, Pokémon plushies and more at crazy prices. Don’t delay, these deals must end 31st July! Terms and Conditions: Prices as marked. While stocks last. Stickered stock only.